Unified Color Technologies has launched HDR Expose, software for creating and editing high dynamic range images. HDR Expose, which replaces the company’s HDR PhotoStudio package, offers all the capabilities of the previous software plus a number of new features, including an interactive HDR histogram, digital color readout, multiple ghost reduction options, import and export plug-ins for Adobe Photoshop Lightroom and Apple Aperture, and a redesigned user interface that helps photographers create lifelike HDR images. Unified Color Technologies provides full 32-bit color editing capabilities based on its proprietary Beyond RGB color space. This color model features a platform that can map a large color space encompassing the full human visual spectrum, including colors found in nature and man-made light sources, the company says. In addition to the updated interface, the software offers a layered adjustment panel to review previous adjustments and a one-click Dynamic Range Mapping tool that sets optimal image processing. The included plug-ins give photographers an export process that automatically sends selected images to HDR Expose for processing and returns the final HDR image back to the original library. HDR Expose enhances features from its previous software package with improved RAW image processing; a new digital readout that lets users measure color values in either the RGB or Bch color space; new editable recipe procedures to simplify batch processing and saving favorites; enhanced performance using OpenCL GPU processing; and new halo reduction and local contrast tools. HDR Expose will be available from the company's Website on July 12 for $149. Users can sign up for availability notification from the Website. An introductory launch price of $99 is available through July 31, and a free 30-day trial version is also available. 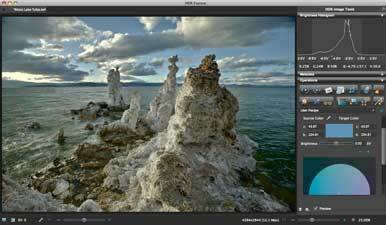 Current HDR PhotoStudio users get a free upgrade to the new software. HDR Expose requires at least a 2.5GHz dual-core Intel Mac with 2GB of RAM (4GB is recommended). The software runs on Mac OS X 10.5 and above. This article was updated after publication to reflect a change in company information regarding the date the software will become available.